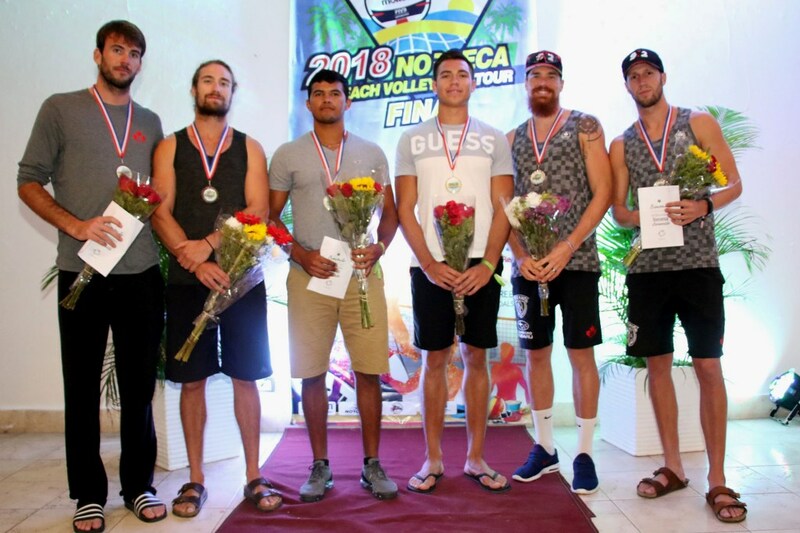 BOCA CHICA, Dominican Republic, October 7, 2018 – Mexicans Josué Gaxiola and José Luis Rubio captured the men’s gold medal of the Boca Chica Beach Volleyball Tournament with an emotional victory in three sets over Canadians Sam Pedlow and Sam Schachter on Sunday evening. Gaxiola and Rubio combined outstanding defense and accurate offense to score a 2-1 (22-20, 17-21, 15-13) victory over the veterans Pedlow and Schachter. Gaxiola and Rubio advanced to the title’s contest after a 2-0 (21-18, 21-14) triumph against Americans William Allen and Ryan Doherty. Pedlow and Schachter needed 38 minutes to defeat fellow Canadians Ben Saxton and Grant O’Gorman 2-0 (21-19, 21-18) in their semifinal match. Saxton and O’Gorman took home the bronze medal following their 2-0 (21-19, 21-16) success against Allen/Doherty. Cubans Karell Peña and Luis Enrique Reyes captured the fifth position after a come-from-behind 2-1 (21-23, 21-13, 15-9) victory over Andy Leonardo and Luis García of Guatemala.